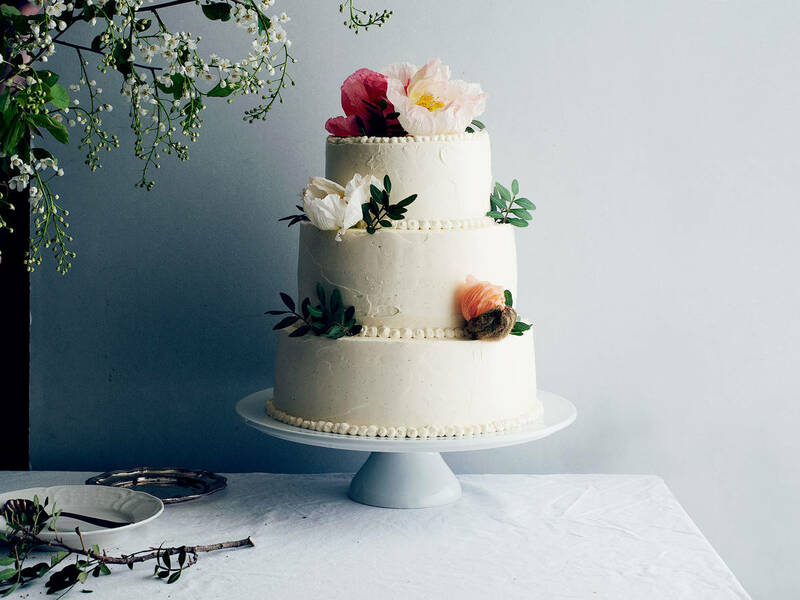 There’s a lot to think about when you embark on making your own wedding cake—or to do so for a friend or family member. But contrary to popular belief, tackling this project is a lot less daunting than it’s made out to be. Follow the recipe below, but first take a look at the following 5 tips for wedding cake-assembly success. We promise you’ll feel less overwhelmed by the time you reach the end. The cake you make is largely a personal choice: Which flavor does the bride and groom love? Are there special dietary needs? What do you like in terms of look? But there are a few things to consider when it comes to building a layer cake of this scale. First, the cake layers can be made well in advance of the event. Since you’ll be making multiple layers of different sizes, it’s a real asset that cake freezes so well. In fact, freezing the cake layers also helps for a more stable assembly and transportation of the final cake, as the cake becomes less delicate the more firm it is. It also ensures that the cake will stay moist if it’s wrapped well in plastic wrap; freezing the cake fresh preserves its moisture, and when it thaws after it is assembled, the result will be as if you made it the same day. When it comes time for assembling each tier, cardboard cake boards are your friends. You can build each tier on a cake board of the same diameter, and then put that on top of a larger one that you can grip when moving it back and forth between the refrigerator and your work surface. To “glue” the boards together to prevent sliding, simply dab some buttercream in the center between them. Like cake, frosting comes down to preference. Whether you like the smooth, refined look of fondant, or prefer lush, rich buttercream, the professionalism of its application comes down to a good foundation. Be sure to level you cake layers so that their surfaces are flush, then apply a crumb coat. The crumb coat serves as spackling to fill in imperfections and create a layer between the crumb of the cake and the final layer of frosting. Take a look at our How To to see how it’s done. Frosting can also be prepared a few days in advance and refrigerated, but if you’re making a buttercream that you want to stay pristinely white, we’d recommend making a fresh batch on the day you frost the cake. Assembly can feel overwhelming, but it is actually one of the most fun parts of the process. Like you’ll read in our wedding cake recipe, it requires some cardboard cake boards, plastic straws or wooden dowels, and some visual guides (usually the pans you baked the cakes in) for centering each tier on top of the next. With the cakes still cold, it should feel quite stable to stack one upon the other. From there, pipe buttercream around the seams to hide any cardboard peeking out. You can continue with buttercream decorations, like flowers or other shapes. We love the look of fresh flowers placed delicately on each tier and on top, instead. The ideal situation would be to transport the frosted tiers unassembled to the venue, then put it together there. Like always, cold (but not frozen) cake tiers are your friends in this instance, as they won’t shift during the journey. Place each tier in a clean cake box the size of its larger cardboard base to secure it. Better yet, travel with others who can babysit the cakes on the ride!